Welcome to the Hridaya Newsletter – December 2014. Joyful, Sacred Holidays! We wish you a season of abundance, grace, and Stillness and hope that your awareness of the Spiritual Heart is ever-present. 2014 was a powerful year of growth and expansion for Hridaya Yoga, especially at our center in Mazunte, Mexico, so we thought we would share a few highlights. Last week, 29 more Heart-centered yogis joined the ranks of Hridaya teachers, celebrating their profound transformation with a beautiful ceremony fueled by spanda. 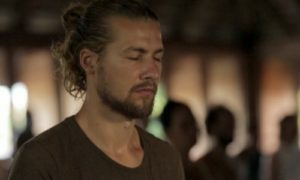 The Hridaya community helped make the annual Mazunte Jazz Festival a truly memorable event, offering inspiration and sharing yoga classes, children’s activities, dance performances, lectures, and more. The Hridaya Center vibrated with the sacred energy of Shakti, as Antoaneta presented the Embody Your Divine Feminine workshop. Sahajananda came home and the main season began, our smiling karma yogis ready to welcome students from our new registration kiosk. The summer was a quieter time in Mazunte and this slower pace provided great opportunities for deepening practice and sharing as a community. Feeling the post-retreat echoes, we took a sunset walk to nearby Punta Cometa, ending the main season with devotional singing, community feeling, and Love. The Art of Awareness workshop with Sahaja offered practical techniques (including Sufi whirling) to allow our real nature to blossom in freedom and Love. This retreat was the biggest of 2014. Over 80 people joined us, including 12 who would go on to complete the Prathyabhijna Retreat, 49 days of silence and Stillness. As you can see, 2014 was a year full of treasures. We will end the year with two special events, and we warmly invite you to join us. On 30 December, we will have a puja to celebrate the birthday of beloved Ramana Maharshi. All the details will soon be posted on our Facebook page, so, from wherever we are, let’s worship together in our hearts in appreciation for this great non-dual master. Please also join us on 31 December for a New Year Eve’s meditation. You can synchronize with Sahaja from 11:30pm-1:00am, on either Romanian or Mexican time. We have many more good things planned for 2015, with monthly retreats, courses, and workshops, including Ahimsa: Embodying Compassion 16-18 January with Nicholas. Visit our calendar for all the details.